LEWIS CENTER, Ohio — More than 275 attended the Ohio Cattlemen’s Association annual meeting and banquet Jan. 24 at the Nationwide Conference Center in Lewis Center, on the outskirts of Columbus. An expanded format offered a county affiliate leaders’ meeting and three educational sessions in addition to the annual meeting and evening banquet. 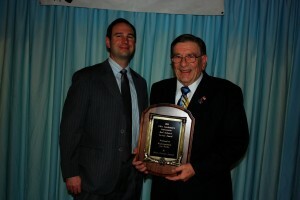 The highlight of the event was the presentation of the association’s major awards. Whitehead Angus Farms, Granville, Ohio received the Environmental Stewardship award; the Dagger Family, Cable, Ohio, received the Commercial Producer of the Year award; Tom Karr, Pomeroy, Ohio, was awarded Seedstock Producer of the Year; Young Cattleman of the Year was Scott Payne, Vinton, Ohio; state Rep. Jim Buchy received the Industry Service Award; and Sam and Laura Sutherly, Troy, Ohio, received the Industry Excellence Award. 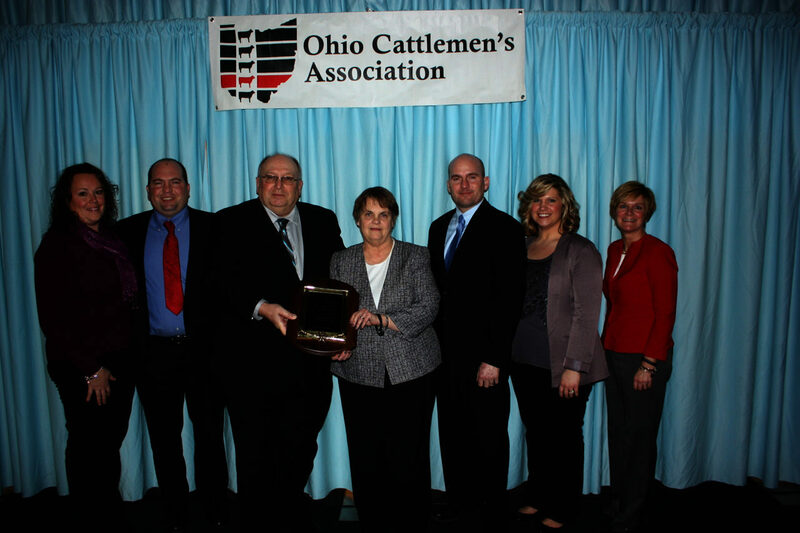 Sam and Laura Sutherly of Troy, Ohio, received the OCA’s Industry Excellence Award, recognizing their continued efforts to promote the beef industry. Sam and Laura, along with their two children, Emma and Sam, have a cow-calf operation of 135 commercial cows. Sam has served as president of the Ohio Cattlemen’s Association, Ohio Beef Expo Junior Show chairman, and now chairman of the Ohio Beef Expo, where he has developed new programs, educational seminars and helped raise funds for the junior show. Laura, a former Ohio Beef Queen, has partnered with OCA and Ohio Beef Council to develop their websites and technology. State Rep. Jim Buchy, R-84, a longtime supporter of Ohio’s agricultural community, received the association’s Industry Service Award. The award recognizes individuals who are not beef producers, but who contribute to the betterment of the cattle industry. Buchy started his career with his family’s meat business in Greenville, Ohio, and started his public service when he was appointed to the Greenville Board of Education in 1980. He was elected to serve in the Ohio House of Representatives nine times between 1983 and 2000, then served as assistant director at the Ohio Department of Agriculture. In 2011, he returned to the statehouse. 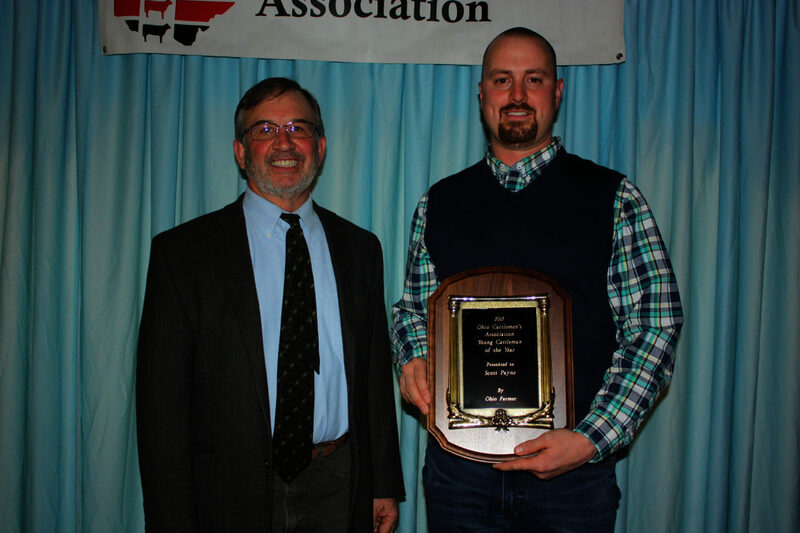 “That’s what I do — I fight for agriculture,” Buchy said in accepting the award. 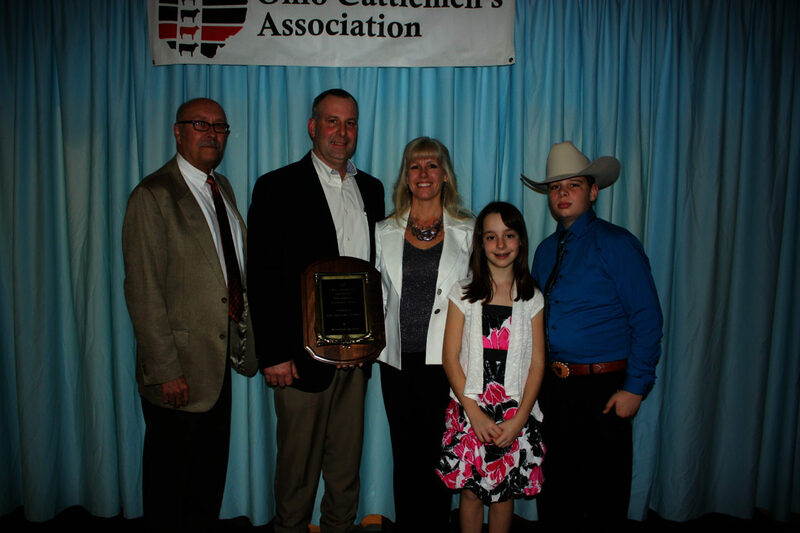 The Ohio Cattlemen’s Association awarded the Larry and Janice Dagger family of Cable, Ohio, with its Commercial Producer of the Year award. 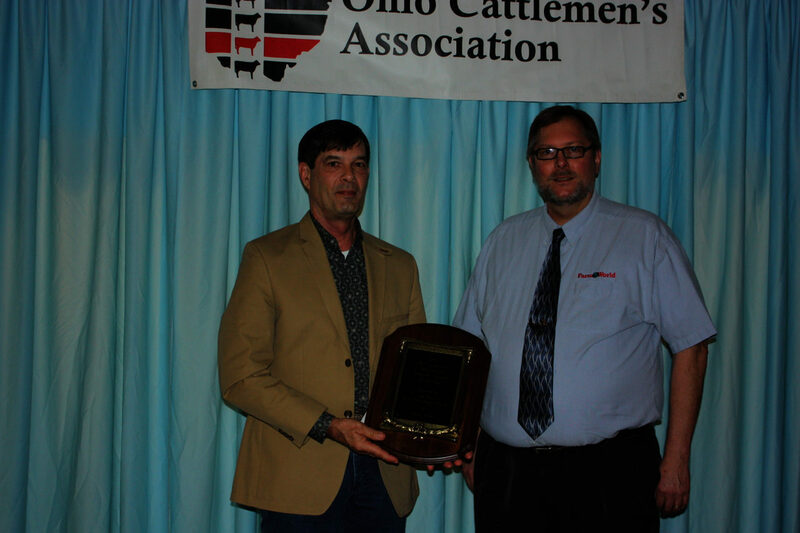 The association and Farm and Dairy jointly sponsor this award to recognize Ohio’s top commercial beef operations. Cable Acres Farms, established in 1890, is operated by Larry Dagger and his sons, Jason and Justin. Currently they manage 175 brood cows that calve in the spring and 45 that calve in the fall. They also custom feed 500 head of Holstein steers marketed through United Producers. The Daggers also produce 400 acres of hay and 1,000 acres of row crops that help to supplement the fed cattle with their own custom mix of feed. Tom Karr, owner of Karr Farms of Pomeroy, Ohio, was named the Seedstock Producer of the Year. Karr Farms became one of the first purebred Red Angus farms in Ohio 20 years ago when Karr decided to transition from Polled Hereford to Red Angus for his own operation. He purchased 150 Red Angus brood cows, and today, Karr Farms sells purebred bulls and heifers to producers throughout the country. Scott Payne of Vinton, Ohio, received the Young Cattleman of the Year award. Scott and his wife, Jamie, have two children, and partner with his parents operation to run Payne Family Farms. They currently have a commercial cattle operation, along with custom feeding dairy heifers and steers. The president of the Gallia County Cattlemen’s Association, Payne also groups his feeder calves with other local producers after pre-conditioning and vaccinating them. He is employed with The Ohio State University where he manages the Jackson County Research Farm for the Ohio Agricultural Research and Development Center. 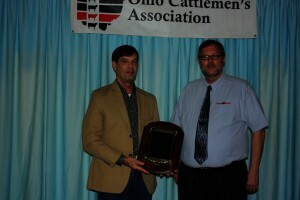 Whitehead Angus Farms, owned by Ben and Buffy Whitehead of Granville, Ohio, received the Environmental Stewardship Award. Ben Whitehead of Whitehead Angus Farms continues the legacy of his late father, Henry, by making major conservation improvements. One of his projects included 50 miles of fence on 320 acres of land that helped to keep cattle out of woods and waterways. Colin Woodall, chief lobbyist for the National Cattlemen’s Beef Association, spoke to members during their luncheon and also during the awards banquet. Discussing the issues the national cattle association is working on, Woodall touched on new dietary recommendations that ignore lean meat proteins; country-of-origin labeling and related WTO rulings, as well as other trade efforts; the slowdown of work at ports along the West Coast; the Humane Society of the United States; and the proposed second beef checkoff that recently got shot down. Certified Angus Beef’s David O’Diam led a lively session on new meat cuts and enhancing value, during which he broke down large beef cuts on the spot. O’Diam is the executive account manager for the Great Lakes region, and holds bachelor’s and master’s degrees with an emphasis in meat science from Ohio State. He marries his extensive meat science background with the marketing and branding efforts of Certified Angus Beef, and was able to give the Ohio cattlemen greater appreciation of consumer demand and merchandising beef. An afternoon session also focused on water quality issues, and featured panelists Glen Arnold, Ohio State University Extension field specialist for manure nutrient management systems; Kirk Hines, a natural resources engineer with the Ohio Department of Natural Resources; Kevin Elder, chief of the livestock environmental permitting program at the Ohio Department of Agriculture; and Frank Phelps, president of the Ohio Cattlemen’s Association who also serves on the Healthy Water Ohio Steering Committee, and has been a key player in the Indian Lake Watershed Project since 1990. A third session featured Michele Murray, who oversees the National Cattlemen’s Beef Association integrated communications that targets both consumers and retail and foodservice customers. She addressed ways the national association shifted gears to target millennial parents, and building advocates in retail, blogging and foodservice partners. During the policy development portion of the business meeting, members considered resolutions on a broad range of topics, including brucellosis vaccinations, coyote and black vulture control and EQIP funding. 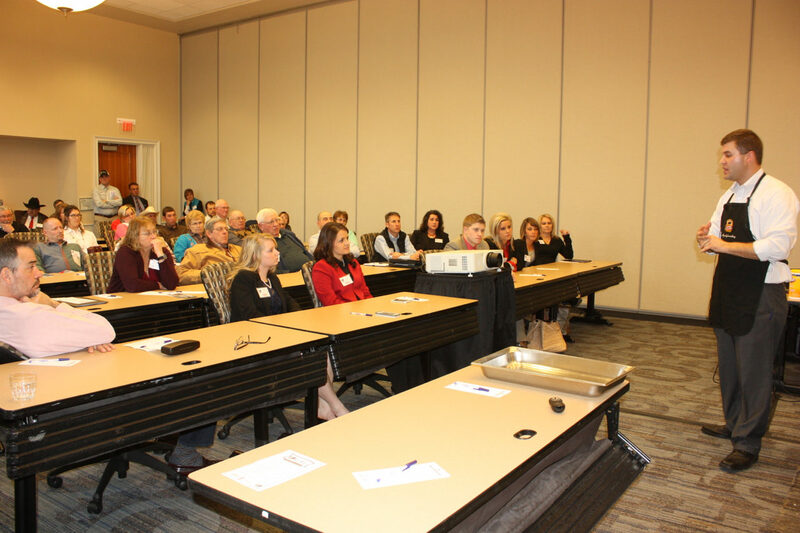 In addition, OCA members discussed the recent rise in farmland values under the Current Agricultural Use Value (CAUV) program and the resulting increase in taxes facing farmer landowners. Members stressed the need for OCA to make it a priority to be engaged in efforts to address the CAUV issue. 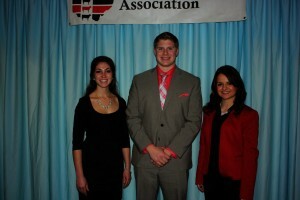 The new Ohio Beef Ambassador team includes (L-R) Laura Schmuki, of Stark County; Dane Walton, of Wyandot County; and Josie Vanco, Gallia County. 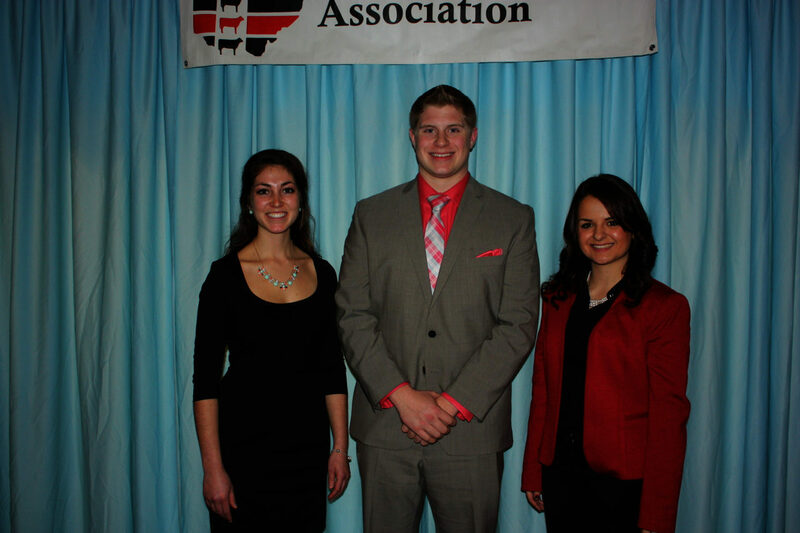 A team of three beef ambassadors was selected to represent Ohio during the coming year: Laura Schmuki, of Stark County; Darby Walton, of Wyandot County; and Josie Vanco, of Gallia County. The beef ambassadors conduct activities and presentations to educate consumers and students about beef nutrition, food safety and production practices of the beef industry. The team is jointly funded and coordinated by the Ohio CattleWomen’s Association and the Ohio Beef Council. Steve R. Rauch Benchmark of Excellence Scholarship: Meghan Hunker, Huron County; Sierra Jepsen, Fairfield County; Laura Schmuki. Tagged for Greatness $1,000 Scholarship: Molly Cleveland, Seneca County; Brittany Conkey, Defiance County; Sarah Johnson, Pickaway County; and Shyla Kreager, Licking County. Cattlemen’s Country Club $1,000 Scholarship: Jordan Bonham, Fayette County; Demi Snider, Hardin County; Nicole Swavel, Crawford County; and Josie Vanco. The Ohio CattleWomen’s Association also awarded scholarships to Sierra Jepsen; Demi Snider; Jordan Bonham; Nicole Swavel; Matthew Greenawalt, Highland County; and Molly Ann Greenawalt, Highland County.